We’ve recently came across a blog post from Wealthfront’s CEO Andy Rachleff where he explains why the company chose Vanguard’s over Blackrock’s ETFs for their portfolios. From our perspective, Wealthfront is a solid robo-advisor, but the decision struck as unbalanced. The main argument Mr. Rachleff presented is that Vanguard has more cost efficient ETFs, and a history of cutting expenses vs. the main rival iShares/Blackrock. Hence Wealthfront partnered with Vanguard for all ETFs (where Vanguard has a competitive offering). While Vanguard may have a cost advantage across different ETFs, we believe that buying ETFs solely based on cost is short-sighted. In some ways, it feels a lot like buying a house based on the price per square foot, without knowing where exactly the house is located, and how good the neighborhood schools are. 1. 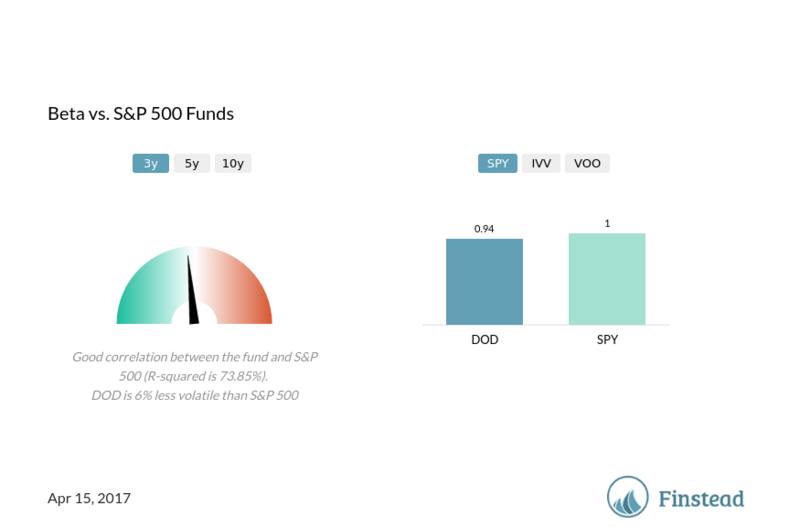 While researching ETFs, it’s important to know how much historically they have returned vs. the benchmarks (let’s choose Vanguard’s S&P 500 ETF VOO as a benchmark fund). Below you’ll see Dow Jones High Yield Total Return Index (DOD)—its return is 8.6 percentage points above VOO for the three-year period. 2. Return is very important, but it’s not the only metric to look at. 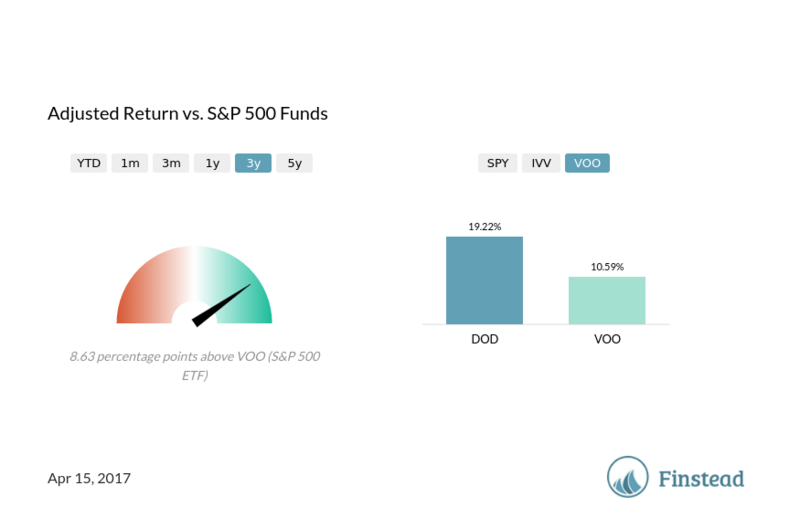 Since risk level can significantly impact the return, let’s look at what the risk-adjusted return looks like for DOD vs. VOO. 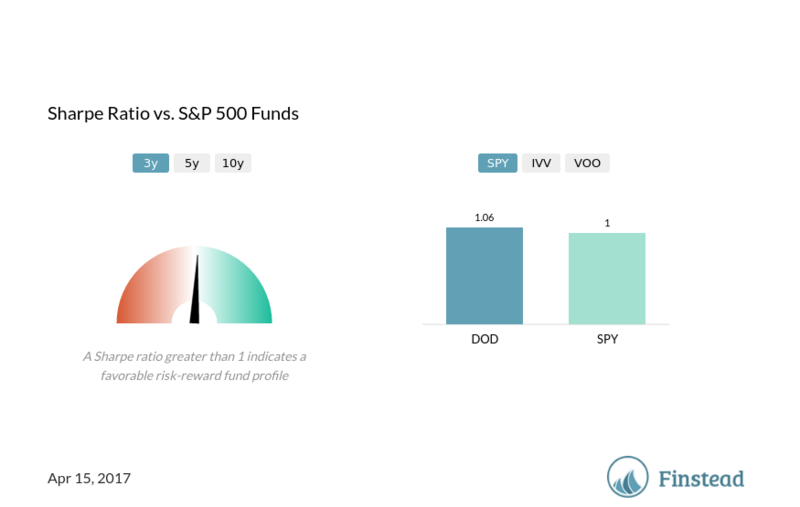 In the Sharpe ratio chart below, you’ll see that the DOD risk-adjusted return surpasses VOO. 3. Now let’s check out the expenses. If you judged DOD just on the basis of cost, you would have never selected it for your portfolio. At 0.75% annual expense ratio, it’s one of the more expensive ETFs—and 19 times more expensive than VOO (which expense ratio is 0.04%). 4. Lastly, let’s not forget about volatility—you should look to maximize the return and minimize risk/exposure. It turns out DOD is less volatile than VOO by 6%--not a huge margin, but definitely something to consider. Don’t get us wrong—we’re not telling you to buy the Dow Jones High Yield Total Return Index ETF. We just wanted to tell you how grossly you could be missing out if you selected your investments just based on cost. 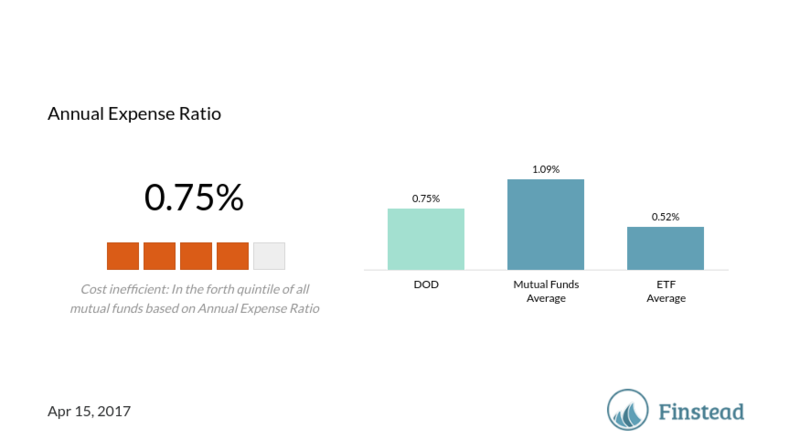 DOD beats VOO on almost every single dimension (cost and risk adjusted return, volatility), but not cost. If you purchase equities just based on expenses, that is in many ways akin to buying a house in your dream town using price per square foot as the only metric to consider!